Your first meal together as husband and wife can be an intimate, enjoyable dinner that affords you both some time to relax. 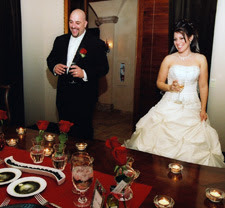 After you sign your marriage license, you can dine in a private room decorated just for the two of you. You'll have a chance to reflect on the ceremony, discuss how great you both look, and marvel at what a wonderful day it has been thus far. You won't have to run from guest to guest or be interrupted by well-wishers while you are trying to enjoy your special dinner. Once you've eaten and taken some time to talk, you can make an event out of entering the reception room for the cutting of the wedding cake. Your guests will have enjoyed a wonderful meal and will cheer you on as you enter. It's the perfect time to start the party!